CGP is a unique and one-of-a-kind product that integrates retirement fund management and life insurance protection in one. It is compliant with the Retirement Pay Law (RA 7641), and can be tax qualified via the Bureau of Internal Revenue. SLU, based in Baguio City, is an excellent missionary and transformative educational institution that is zealous in developing human resources to be creative, competent, socially involved, and imbued with a Christian spirit. InLife is the first, largest and only mutual Filipino life insurance company that applies its over 100 years of experience in financial protection, savings, investment, and retirement to help individuals and corporations make confident financial decisions. 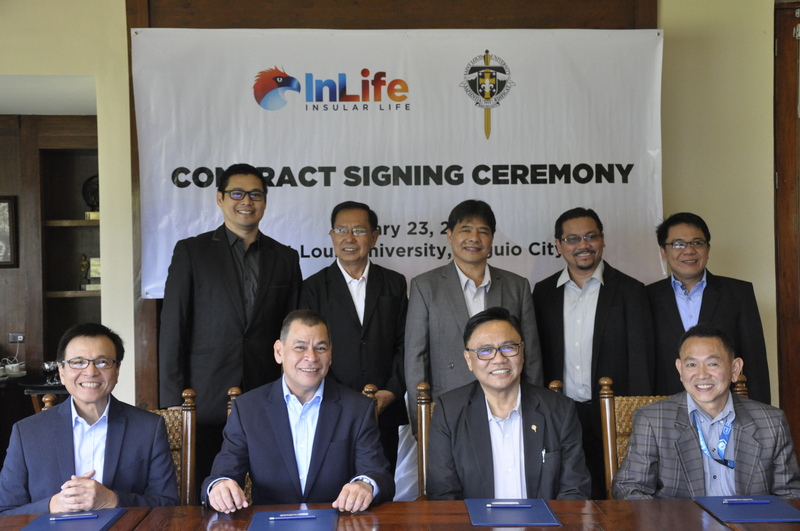 The contract signing was attended by the top executives of both InLife and SLU. Shown in photo after the signing of the agreement are (seated from left:) InLife FVP & Head of Corporate Sales Carlito Lucas, InLife SEVP & Head of Agency Distribution Raoul Antonio Littaua, SLU President Fr. Gilbert Sales, CICM and SLU VP for Finance & Corporate Treasurer, Dr. Noel De Leon. Standing from left: InLife Sr. Account Executive Eumir Cruz, InLife Unit Manager Alwin Bartolome, SLU Assistant Treasurer Art Calwag, SLU VP for Operations Atty. Jason Barlis and InLife Manager & Team Leader for Corporate Sales Archie Francisco.